Thread is an essential trim in garment sewing. In mass production, total thread requirement is calculated based on thread consumption per garment. Thread consumption calculation method is explained in an earlier article How to calculate thread consumption for garments? Product to product thread requirement varies and factors those affect in resultant thread requirement per garment are explained below. Each product has different number of components to be sewn together and different seam length. Fabric types and seams used in making garment, machines to used depends on the product. 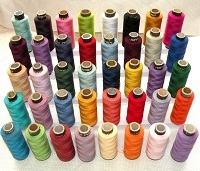 So first and foremost a product is the main factor for having different thread consumption. Normally, you can say that product with less no. of components and shorter seam length require less thread. Technical factors those determine actual thread requirement are as following. #1. Seam and Fabric thickness: As the thickness of seam increases thread consumption per stitch formation increases. Seam thickness varies on no. of fabric layers to be sewn together and thickness of fabric sheet. #2. Stitch Class: Different stitch classes need different no. of threads for single seam stitching. As no. of threads in a stitch increases, thread consumption increases accordingly. For example, a 5 thread over lock machine requires more thread than Single needle lock stitch machine to sew same length of seam. #3. Stitch per inch (SPI): How many stitch to be formed in an inch of seam? No. of SPI may vary product to product, seam to seam and fabric quality. Thread consumption increased when stitch density increases. #4. Thread tension: Thread tension also play a role in consuming thread. Higher the thread tension, less is the thread consumption. #5. Thread Count/ Tkt. : Thread count is also a factor that affects determining thread consumption to some extent. Thicker the thread is, higher is the consumption. #6. Machine Type: Stitch class and machine type both are linked to each other. But still consumption varies machine to machine in term of length of thread tails at the start and end of the seams. An over lock machine consumes more thread compared to single needle lock stitch machine. In the same machine type for single needle lock stitch machine, a UBT machine will consume less thread than a Non UBT machine for the same reason. #7. Production system: This is not a technical reason but need production system to be considered as what wastage percentage to be added to calculate final consumption. Reason, in an assembly line thread tubes/cones are distributed among many number of machines. At the end of production of one color each machine end up with certain length of unused thread in tubes. Such kind of wastage increases when a production line has higher no. of machines. Different factors that effect thread consumption in garment making.